Plating Color: Gold Or Silver Occasion: Daily Wearing, Wedding, Gifts, Parties, Etc. 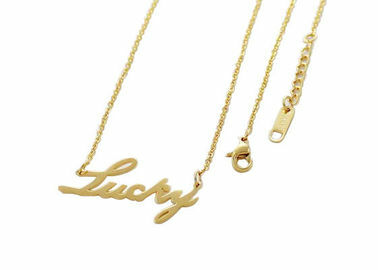 Stainless Steel Necklace with pendant in letter of "Lucky". Material: normally we use 304 stainless steel with cheaper cost, if you need better quality, we can use 316 stainless steel instead. Sample trial orders for inspecting the market are welcomed.